Most users of food composition databases would like them to be “comprehensive”. The objective of the food composition programme is to ensure that the database includes a range of food items that covers as completely as possible the foods eaten by the population for which the database is being prepared. However, the ideal of a truly “comprehensive database” is, in fact, an impossible objective, primarily because of the very large number of foods forming the human diet, especially if one includes all possible variations in the range of cooked mixed dishes. The continuous development of new food products by the food industry and new plant varieties and animal husbandry techniques by the agricultural industry means that analysts and compilers are aiming at a constantly moving target. The volume of analytical work required for comprehensive coverage and the resource implications of this work also make it impracticable. Therefore, those involved in the food composition programme – through a national steering committee or other consultative means – have to develop a strategy for establishing priorities in selecting food items for inclusion. The approach described below is suitable for use in preparing a database de novo. In practice, however, this is very rare because most countries or regions have some existing information available in the form of food composition tables or a computerized database. However, the strategy suggested is equally valid for use in the revision or extension of existing information. A range of different sources of information needs to be considered when establishing priorities. These are summarized in Figure 3.1 on page 34. The ideal is, first, food consumption statistics. Foods that are most commonly consumed in terms of both frequency and amounts consumed, provide a list of “core foods”. In identifying these foods it is necessary to look beyond the statistics for the total population to the consumption patterns of specific subgroups, particularly infants and those with specific dietary requirements. Within the population, ethnic groups with distinctive dietary patterns also need to be considered, as do different socio-economic and regional groups. Data at the commodity level are available from the FAO Statistical Databases (FAO, 2003), and data from household or individual surveys are often available from government ministries of statistics, health or agriculture. The food consumption statistics should then be used to estimate the nutrient contributions of the different foods (Chug-Ahuja et al., 1993; Schubert, Holden and Wolf, 1987). The USDA has developed a procedure using food consumption data and nutrient values for developing the Key Foods list (Haytowitz et al., 1996). Key foods have been defined as those foods that contribute up to 80 percent of any one nutrient. When total nutrient contributions from the key foods are aggregated, they should account for approximately 90 percent of the nutrient content of the diet for the nutrients examined. This method utilizes existing nutrient profiles and nationally representative data collected from food consumption surveys. More samples are collected and prepared for foods that provide important amounts of nutrients of public health significance to the diet, and not every sample is analysed for all the nutrients currently in the database (Haytowitz, Pehrsson and Holden, 2000). This key-foods approach forms the core of the current USDA nutrient analyses contracts (Haytowitz, Pehrsson and Holden, 2002), and many other countries are adopting this method (Galeazzi et al., 2002). The contribution to energy intakes should be the first to be examined; this establishes the foods that may be considered as the staples in the diet. Other nutrients should be examined in a sequence related to their public health significance. In some countries, protein would be considered next; in other countries, the preferred focus would be the nutrients that are not evenly distributed in foods, for example vitamin A (retinol), vitamin C, iron and calcium. Where iodine deficiency is a public health issue, sources of iodine will need to be included. Vitamin A deficiencies would indicate the need to consider foods that are rich in provitamin carotenoids in addition to sources of retinol. The numbers of additional foods will progressively be reduced using this sequential key-foods type of approach. The importance of food trade needs to be considered when preparing a list of foods. In food-exporting countries, the list may also need to include the foods most important to the export economy, particularly processed foods in view of the fact that nutrition labelling is required for these by many importing countries. Food consumption statistics may be very limited for many populations and in establishing priorities alternative strategies may be needed. One useful approach is to prepare a list of foods consumed and make subjective estimates of their importance. The list needs to be compiled using a number of sources, e.g. government departments, university researchers. As food consumption patterns are largely determined by socio-economic factors, it is important to involve those sectors of the community in preparing the list. Food production and retailing statistics may also be useful sources of information to assist in constructing the list. The Food Balance Sheets and Food Supply databases published by FAO, which are available for most countries, also provide data on national domestic availability of foods and their per capita contributions to the energy, protein and fat supplies (FAO, 2003). 2 Dignan et al., 1994. It is often convenient to structure a food composition database using food groups. This ensures that the diet as a whole is considered and that the focus is not distorted by emphasizing one food group at the expense of the diet as a whole. There is no internationally standardized approach to food groupings. At the 16th International Congress of Nutrition, the INFOODS presentation reported on the issue of food groupings (Burlingame, 1998). Most food composition databases have between 10 and 25 food groups. Even though the concept of food grouping seems to be internationally agreed upon, the actual classification of food has been shown to be highly culturally dependent and most national databases have unique examples. The Pacific Islands food composition tables (Dignan et al., 1994), for example, have coconut products as a group because of the economic and cultural importance of this food and the diversity of products. Other countries divide coconut products between several different food categories such as fats and oils for coconut oil; nuts and seeds for coconut flesh; beverages for coconut water. The Central America and Panama (INCAP) database has three groups that are unique: bananas, maize and cornbreads (FAO/LATINFOODS, 2002). The ASEAN food composition database has edible insects as a group (Puwastien et al., 2000). 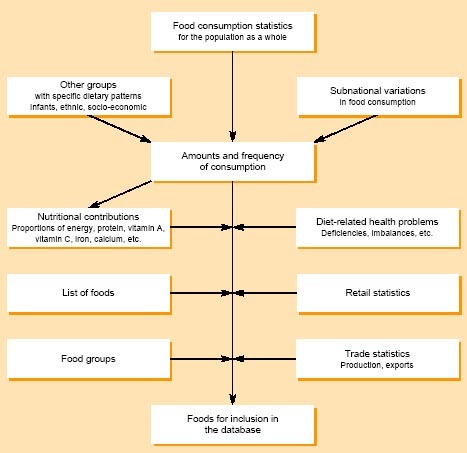 Researchers and nutritionists in international organizations often report population nutrient intakes by food group rather than by individual foods, suggesting the importance of standardization for international data comparison. The food groups used in the past by FAO (1982), and currently in the UK (Food Standards Agency, 2002), and Pacific Islands food composition tables (Dignan et al., 1994) are shown in Table 3.1. The procedure when revising an existing database is very similar to that of compiling a new one, but it will be necessary to consider also which foods may need updated values. Changes in food consumption patterns should be taken into account, and the values for food items for which there is evidence, even presumptive evidence, that the food has changed in composition since the last database was prepared should be reviewed. Changes in food production – both primary in agriculture, and secondary in food processing, marketing and storage – will also need to be considered. Consultation with the food industry and, where possible, with research groups specializing in the study of specific commodities, often provides useful information on changes that have taken place. Figure 3.1 (page 34) illustrates the stages in the establishment of priorities and the selection of foods for inclusion in the database. At the level of specific foods in each group the strategy requires knowledge of the marketing and consumption of foods. This information will also be required in drawing up the sampling protocols, which is discussed in Chapter 5. Information will be required from departments of agriculture, commodity boards, trade associations and research groups involved in the study of specific foods. Retail trade journals and consultations with food manufacturers can also provide information on the relative market shares of different brands of the same product. The inclusion of proprietary or brand­name foods should be restricted to stable, well-established lines if frequent revision or updating of the database is not possible. It may be possible to include brand-name foods where these products are unique, or combine foods such as cheeses (e.g. hard cheeses, blue-vein cheeses) or biscuits (e.g. sweet, savoury, filled) into generic compositional types. Once a clear idea of the relative importance of various foods has been reached and a provisional list of candidate foods for inclusion drawn up, existing compositional data on these foods should be examined following the principles set out in Chapter 10. This process will review the quality of the data and their applicability to the food currently consumed and will establish whether or not sampling protocols need to be developed to provide the necessary data for their inclusion. It is often useful to group the foods at this point into subgroups as outlined in Table 3.2. These may be arranged according to the type or use of the foods. Subgroupings of foods with similar matrix and nutrient characteristics often provide a convenient basis for developing common sampling and analytical approaches. The different levels of use of compositional databases require compositional data to be given for foods in the raw state, in the processed state, and as prepared for consumption. Where resources are limited, priority should be given to providing data for the most important foods in their raw state and the most common forms in which they are consumed. Where foods are commonly consumed in more than one form (e.g. peeled and unpeeled; boiled, fried or roasted), values should ideally be given for all these forms where resources permit. A pragmatic approach may need to be adopted to conserve resources by preparing one form of the food in one way and another type in another way and then extrapolating the composition for the different methods of preparation. For example, different cuts of bacon may be analysed in their raw state and one cut analysed after frying and another after grilling, with the observed changes being extrapolated to all cuts. The human diet typically includes a wide range of prepared foods with often complex recipes, and it is rarely possible to analyse all the different types of dish. In such cases, it may be decided to calculate the composition of the dishes from the recipes, taking into account the changes in weight on cooking and nutrient retention factors. The most common cooking methods and the major nutritional changes associated with each are listed in Table 3.3. The table indicates the information required to calculate the composition of the cooked foods from the raw food or ingredients. In some instances calculation is not really suitable and complete analysis should be undertaken if the food is sufficiently important in the diet. The food preparation may be carried out in a laboratory but it is essential that local cooking methods be reproduced as closely as possible, if examples of the cooked food cannot be collected (e.g. Greenfield and Kosulwat, 1991). Some traditional methods are difficult to replicate in a laboratory, e.g. the Pacific Island earth oven (Kumar et al., 2001) and great care is needed in obtaining values using these methods. In such cases, local knowledge of food cultures, and possibly the advice of anthropologists, is essential to guide the process. Most databases use analytical values obtained by analysis of the edible material. During the selection of food for inclusion in a database, it is therefore necessary to identify the edible matter to be analysed. This will often be influenced profoundly by the cultural norms of the population for whom the database is being prepared. The inedible portion, or refuse, should also be measured and recorded in the database, since many users, particularly those in food service management, will be calculating nutrient content on the basis of foods as purchased. Table 3.4 provides examples of edible and inedible portions of some foods. Accurate use of any database requires that the food items are correctly identified; thus compilers need to consider carefully how foods are named in the database. Several authors have discussed the issue of food nomenclature (Arab, Wittler and Schettler, 1987; McCann et al., 1988; Truswell et al., 1991). Loss of heat-labile and other micronutrients. Note: All foods and/or ingredients need to be weighed before and after cooking. Note: The inedible portions usually include damaged material. The decision whether a part is edible or not depends on cultural norms and individual preference. The portions in parentheses may or may not be discarded. Consumers in different parts of a country often give foods different names and the same names are occasionally used for different foods. Provision for a thesaurus of alternative names should therefore be made early in the database compilation process. The names of foods should, as far as possible, be those used by the intended users. Foods covered by legislation with regard to labelling and/or composition should be named in the legally approved way. The name of a food is frequently insufficient for its unequivocal identification, especially when a national database is used internationally. Food descriptors are therefore needed to identify the foods more clearly and identify the type of preparation used. The use of a systematic series of facets (i.e. properties or attributes) is recommended. A faceted descriptor system permits better searching of large databases, where the same word can represent very different things (e.g. “green” can be a kind of pepper, or a state of maturity), and, when standardized, also facilitates data interchange. Various attempts have been made internationally to standardize systems for naming and describing foods (Truswell et al., 1991; Ireland and Møller, 2000), but international agreement has not yet been reached. The most usual facets are listed in Table 3.5, although any facet that aids identification may be used. Information relating to these facets must be compiled during the collection of samples and their analysis; this has important implications for record-keeping during sampling, which will be discussed in Chapter 5. Note: This list is not exclusive; all facets that aid identification should be included. 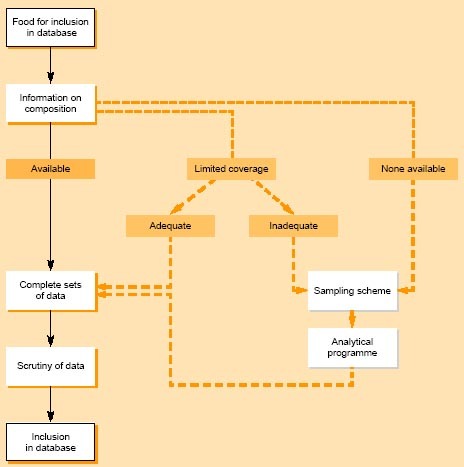 The priorities for inclusion of foods in a database need to be considered alongside the priorities for inclusion of nutrients and other constituents because the combined requirements will have implications for the total sampling and analytical resources needed. If a large number of nutrients are to be included this may limit the number of foods that can be analysed using the usually finite resources available, and vice versa. Figure 3.2 illustrates the selection of foods for analysis. The first essential step is to evaluate any existing information. This may show that complete information, which is still valid for the current food supply, is already available. It may also indicate that where a food is imported it may be possible to use data from the country of origin. However, the information may be limited, or deemed inadequate, and may need to be supplemented by additional analyses – for example, when a constituent has not been measured before, or where the method of analysis used previously is no longer considered reliable. In such cases sampling and analytical protocols will need to be devised. Where no information is available and the food is judged important, sampling and analytical protocols will clearly need to be devised. Finally, all the available data will be scrutinized to ensure that they are of compatible quality. This step also has resource implications, as highly trained personnel will be needed to undertake this important last step.